The majority of the world’s religious population is made up of followers of either Christianity or Islam. 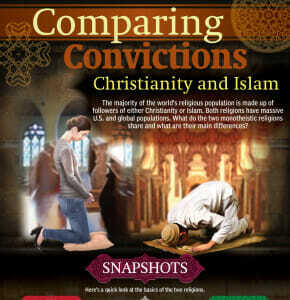 Both religions have massive U.S. and global populations. What do the two monotheistic religions share and what are their main differences? Here’s a quick look at the basics of the two religions. Dates back to: about 33 C.E. Dates back to: about 622 C.E. The Hebrew Bible (The Old Testament) is a divinely inspired text. We are all descendants of Abraham. The roles of God include Creator, Forgiver and Ultimate Judge. God sent a prophet to teach humans about morality. An Anti-Christ will rise before the End Days. There is a Heaven (Paradise) and a Hell (Separation from God). There will be a day of judgment for all humanity. The Ten Commandments should be followed. Jesus was born through the Virgin Mary. Islam rejects the Holy Trinity. The Prophet Muhammad is not a form of God, as Jesus is considered in Christianity. In Islam, angels are not divine and are not to be worshiped; they were created by God, just as humans were. The “god” in both religions, God and Allah, are not identical. Muslims do not believe in the doctrine of Original Sin, as Christians do.